Note: I’m attempting a new style of book reviews so that it’s easier for readers to figure out what they’d like to read and to give some better information. So bear with me, please! Why Read: I’ve always been a gigantic nerd when it comes to Terry Pratchett. I watched one of the films by accident, “Hogfather”, and was hooked from that moment on. 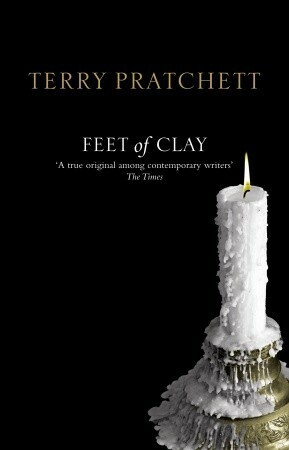 Feet of Clay was my attempt to get some light-hearted reads in while trying in vain to finish Sense and Sensibility. And if you’ve read Jane Austen, you know that light-hearted humor is of the most importance when you’re struggling through one of her romance novels..
Review: I think I shall always love reading a good Terry Pratchett novel, and Feet of Clay was no exception. Classic quick-witted prose that had be struggling desperately to keep up with all of the event passing by – I will always love his novels. There’s something just so perfect about an Assassin’s Guild who operates quite legally in the city Ankh Morpork. Now that I’ve finished the novel, I can absolutely agree that the cover is entirely appropriate – and I encourage other readers of humorous fantasy novels to try it out. Character-wise, there is no one better to run the crime division in Ankh Morpork (who does not like Clues, no sir), than Vimes. He is a continuing character throughout many of Pratchett’s other novels, but he plays his role here spectacularly – being every inch the grumpy but excitable Commander that we all know he is. When it comes to plot, Feet of Clay was one of those unique novels that had me guessing until the end. The main problem species in the book is the Golems, a race that is considered by the people to be servants and to not have souls. Even the clergy demands that any Golem being found sentient must be destroyed at once because God did not create it… However, when it appears Golems are killing people and are to blame for many deaths, it is up to Vimes and his motley crew of a female dwarf who no one believed was female, a werewolf who is convinced she cannot live in the city, the lower policeman Nobby Nobbs (who may or may not be the heir to the Kings position), and Carrot (the man who is far too good-natured to be normal). Although I enjoyed the book heartily, I could not in all truthfulness give it 5 stars. It was a great read, but could not stand up when I thought of other books I have previously given 5 stars, including The Historian by Elizabeth Kostova and Fahrenheit 451 by Ray Bradbury. Nevertheless, thank you Mr. Pratchett, you always succeed in making me smile.